"Stitch Fix has re-invented shopping, the way women really want to shop. Keep your wardrobe up-to-date with no hassle. You give us your size and style preferences, and your stylist sends you a selection of 5 items picked just for you. Try everything on at home, and only pay for what you want to keep! Free shipping both ways and a 25% discount if you buy all 5 items." The styling fee is $20, and then that goes toward whatever you want to buy. Thank to you anyone who has signed up using my referral link! Whenever someone signs up with your link and gets her first box, you get $25 credit. Which is lovely. Also, let me clarify that this is not a subscription -- you pick when and how often to get a box! So no need to worry about fees or commitments. Alright, let's get to the clothes! THANK YOU to my wonderful stylist, Dolene. You rock. It was another fabulous selection! Again, I kept the whole box. Firstly, I asked for an open cardigan, mainly because I gave my mom one for Christmas and it looks so amazing on her that I regretted not getting one for myself. 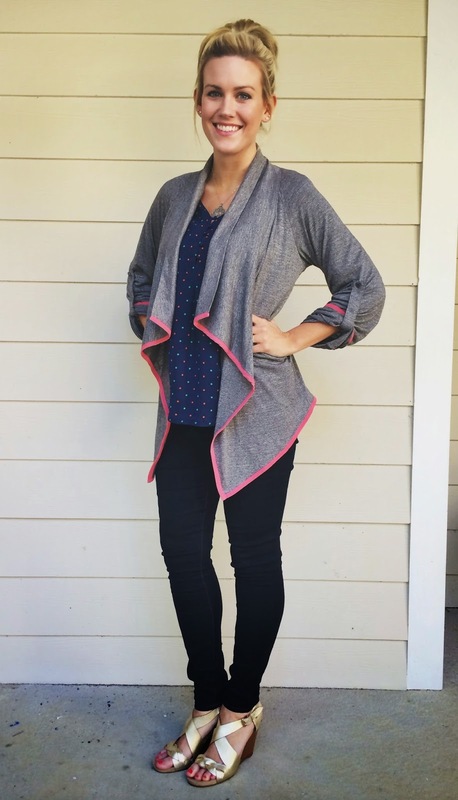 My stylist picked out the Pomelo Carla Contrast Trim Drape-Front Cardigan. It's perfect! The color, the detail, the fit, the extreme pajama-like comfort...I love it. I also asked my stylist for this box to be more "springy", and this is a perfect transition piece. Underneath it is the next item, the Daniel Rainn Minna V-Neck 3/4 Sleeve Dot-Print Blouse. When Jordan first described it to me and said "with attached tank top" I was like noooo. No. No. I loathe attached tank tops (and also built-in bras for that matter) because they never fit me. Butttt...this one did! And is a wonderfully soft, stretchy material that I appreciate. I was pleasantly surprised. It is lower in the back, so here is a back view. I love the navy with coral and mint dots. By the way, those wedges are my favorite shoes of all time that I got in 2008 I think. They're Nine West in a size Narrow which is SO HARD TO COME BY. I could write full posts, nay, books, on my lifelong quest for shoes that fit my feet. Maybe I will. But anyway, they are the best shoes ever and I will mourn them if they ever become unwearable. The jeans are high waisted skinny ones from American Eagle. They almost look black in the pics, but they're just a dark denim wash. Their "high waist" is actually pretty regular to me, haha. They don't come up to my belly button or anything. (Let's not even talk about how their "regular" rise jeans fit me. I'll just say if I wore them I'd never be able to bend over, ever.) But I LOVE AE jeans. I have a pair from 9th grade that have been patched three times and I can't wear anymore due to the fact that when you hold them up they are see through. So yeah. I digress. The next item is probably my favorite of the bunch: the Collective Concepts Cathleen Abstract Print Tulip-Sleeve Blouse. 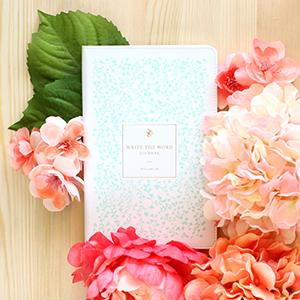 These colors are perfect for spring! And I love the cut of the top which hangs a little bit lower in the back. It's so different from anything that I have and was just the kinda thing I was hoping for with this box. Thumbs UP! I also got a dress in my box for the first time. It's the Under Skies Gabrielle Ikat Print Fit & Flare Dress. The fit and flare style works great for my body type. The waist band is stretchy, but not too stretchy to where I have to tug on it all the time. I was quite pleased with this and will probably be wearing it to a couple spring/summer weddings. So there ya have it! A successful Stitch Fix Box #3! When it comes to pricing, the cheapest items I've gotten have been in the $35-$45 range. The highest priced items I've gotten have been the pants which were in the $80s. You can set your preferred pricing range when you fill out our profile, and I have all of mine set on "as cheap as possible", haha. What's made it worth it to me is the convenience, the discount when I keep the whole box, the credit I've received, and the fact that I haven't purchased any other clothes AT ALL since November. If you want to, please do use my referral link when you sign up to try it! Thanks so much. Hope y'all have an amazing weekend and that some of you are getting a break from the snow! Spring is coming, y'all. I hope. Girl, everything looks so great on you!! The cardigan is SO cute and I love the pink trim. And all those tops are great!! Love all of those tops!! Loved them all! Your favorite shirt was my favorite too! Love the dress!! Here's the latest fix I got. Glad you found fun things to keep! I am loving that dress and the open cardigan!! What a great concept! Wish they had it here in Norway! 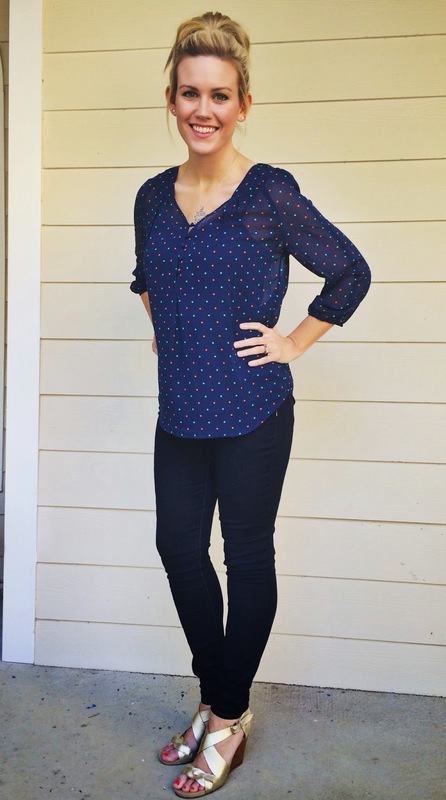 Love Stitch Fix, and your pieces are awesome -- and look great on you! I'm hoping for more tops in coming boxes, though I've loved all the dresses I've been sent. So much fun. And like you, I love the convenience and haven't really been clothes shopping since I joined! Just got my first Fix this week! :) Loved your pieces-- especially the polka dot top! Great box! My favorites are the collective concepts shirt and the dress. Beautiful on you! I'm trying out StitchFix and StylingOn as well to see which is a better fit! You're a babe! I plan on doing this one day...when I'm not in graduate school. My fave is definitely the dress and then the coral/mint/navy dotted top. You should be a model. ok...bye. I'm waiting on my first fix...so nothing to post yet. Have to wait until MAY! I am dying to get my box. I live pretty far away from major shopping, which means I am thrilled about this service.